Bring a friend with you to the July 2016 Embracing Health Detox, Healing & Raw Food Retreat, and you will receive a $500 Gift Voucher! Your are welcome to use the gift voucher towards the retreat price for yourself, or your friend, or both, or towards extra massages, spa treatments, colonics or naturopathic appointments during the retreat. The voucher cannot be exchanged for cash or used towards other products or services at the retreat. Limited places apply, secure your place today! Share this life-changing experience with a friend or partner, and reap the rewards as you take your health to a new level at this naturopathically designed and supervised retreat in the tropical paradise of Ubud, Bali. 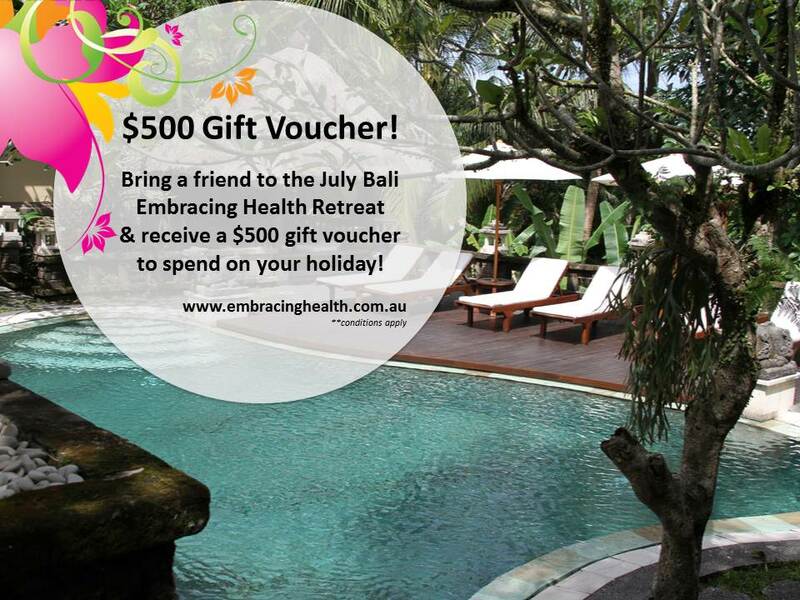 Go to www.embracinghealth.com.au/retreat to secure your place and receive your $500 gift voucher! hanging experience with a friend or partner, and reap the rewards as you take your health to a new level at this naturopathically designed and supervised retreat in the tropical paradise of Ubud, Bali. Next post: Winter Is Here!